Whisk together the Caesar dressing, lime zest and jalapeos in small bowl; set aside. occasionally to keep fish from sticking. for smaller fillets if necessary. (Reduce cook time by half for fresh or thawed fillets.) Cook just until fish is opaque throughout. 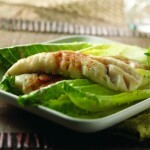 Cook's Tip: Substitute Alaska Cod or Sole fillets for Alaska Pollock; adjust cook time for fillets if necessary.